When creating our new valve line we set out to create the best performance longest lasting valves available to the aftermarket. Using advanced 3D design and simulation programs we have created a stronger and higher flowing valve head design. We flow test prototype valve heads in the specific applications to make sure we have the highest flowing valve head available on the market today. With the materials used we have less valve distortion at the face than any of the tested designs. Less distortion allows or better sealing under extreme conditions and more consistent performance threw the life of the valve. GSC Power-Division’s valves are sure to become the industries standard for sport compact performance valves. 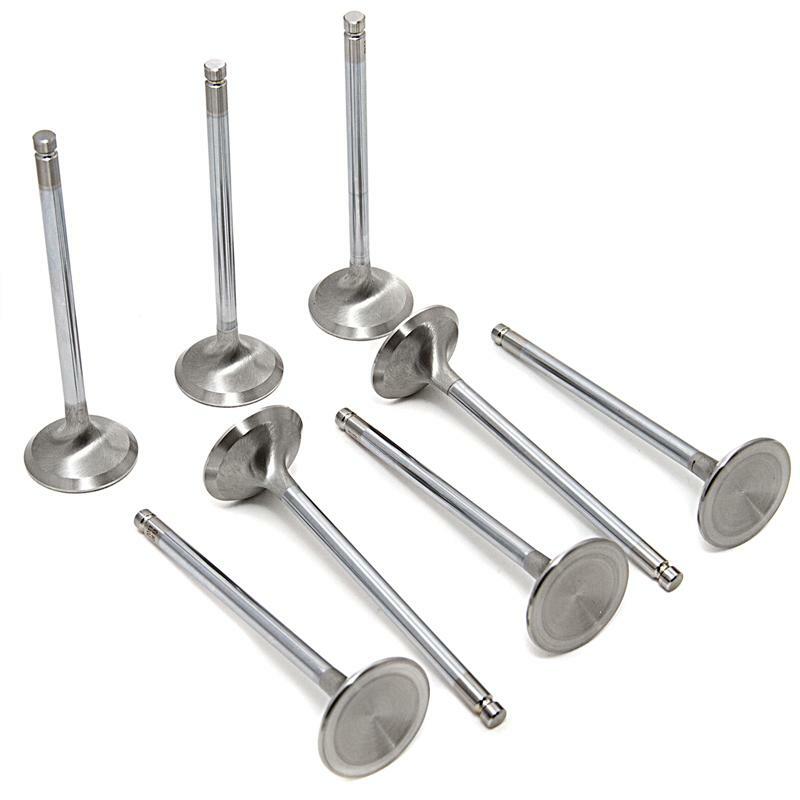 The new Super Alloy Exhaust valves were designed for engines used in extreme conditions. With advancements in manufacturing technology and metallurgy, GSC Power-Division was able to design a blend of Super Alloys that can handle the immense heat and power levels of today’s ultra-high horsepower turbocharged and normally aspirated engines. The GSC Super Alloy exhaust valves are designed to withstand EGT’s between 1800-2000F. Each Super Alloy Exhaust valve utilizes chrome polished stems to create a smooth, durable finish for added life and better lubricity especially when paired with GSC manganese bronze valve guides. Strength, heat resistance and performance are engineered into every valve. In addition, head dish is maximized for weight savings while swirl polished and back cut heads promote better air flow without sacrificing durability. GSC Power-Division Super Alloy Exhaust valves are available individually or as sets of 8 or 12 depending on the application. Head sizes are either standard or +1mm. Back cut to reduce valve weight for higher rpm, higher boost pressure and allow for more aggressive cam profiles without increasing valve spring seat pressures. Valve stems are micropolished to allow for less oil retention on the stem which creates less drag on the stem to guide for a smoother motion. Fully nitrated ( this includes the 45 which increases valve life and makes a better seal at the valve seat for improved cylinder pressure) also reduces carbon buildup on the backside of the valve. Intake valves are a modified 21-4n stainless and Exhausts are a modified 23-8n stainless material for high heat capacity while maintaining longevity. Valve tip lengths. We have taken extra time to adjust tip heights on the applications to require less tipping of the valve to maintain proper tip height for proper valve train geometry, and to cut down on install times when setting valve lash. We have also adjusted the Keeper grove to properly balance intake and exhaust spring pressures to reduce the use of valve spring shims and maximize performance from our spring and retainer kits. Valves will work with an oem keeper/lock or when available our upgrade keeper/lock. It’s not mandatory but it is suggested that any valve lock not be reused on performance applications do to material grooving.